Lately I’ve been itching to build a diorama. I think the last one I built was the Mermaid Sandcastle in the spring of 2012. 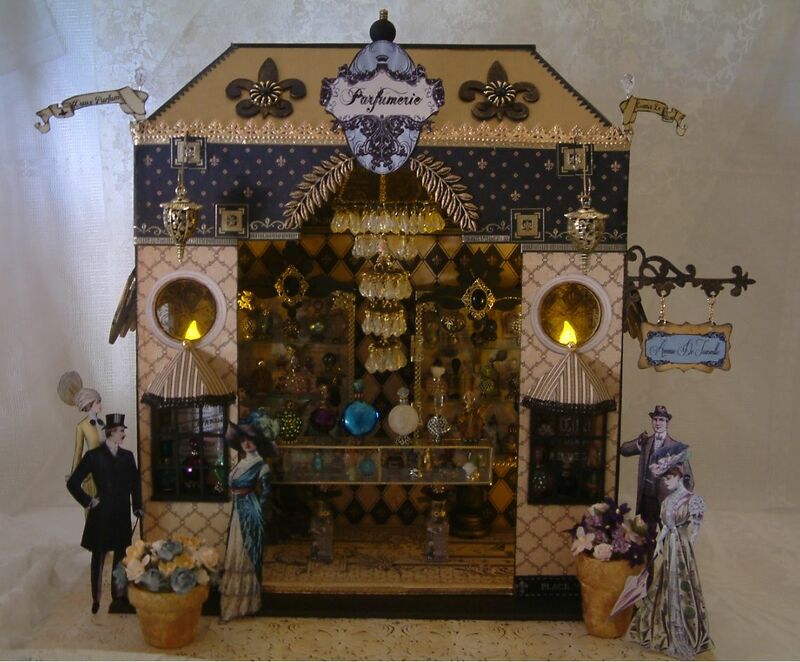 I’m a big fan of Downton Abbey and Selfridges so I decided to use Edwardian fashion as my muse and create a French perfume shop complete with a beaded chandelier, perfume bottles made from bead caps and beads and glass cases for their display. 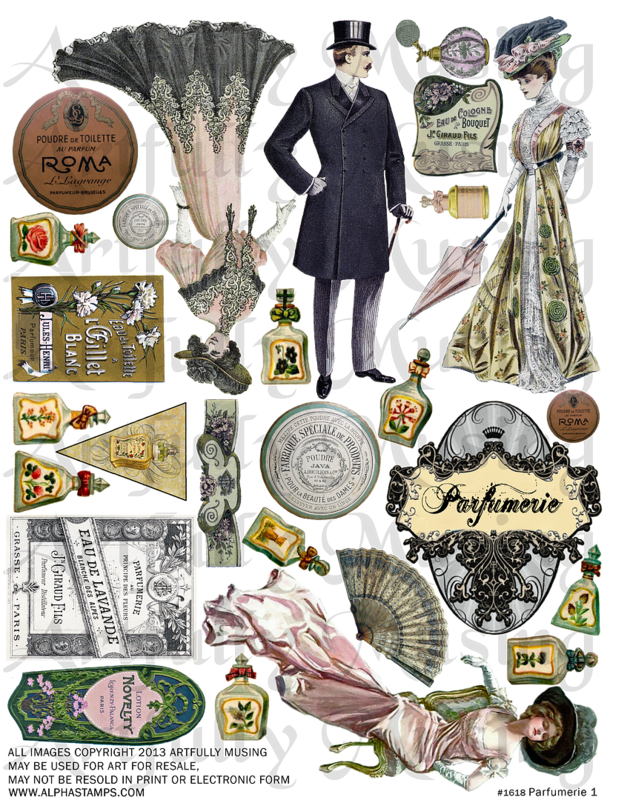 To go along with the project I’ve designed two new collage sheets; Parfumerie 1 and Parfumerie 2. 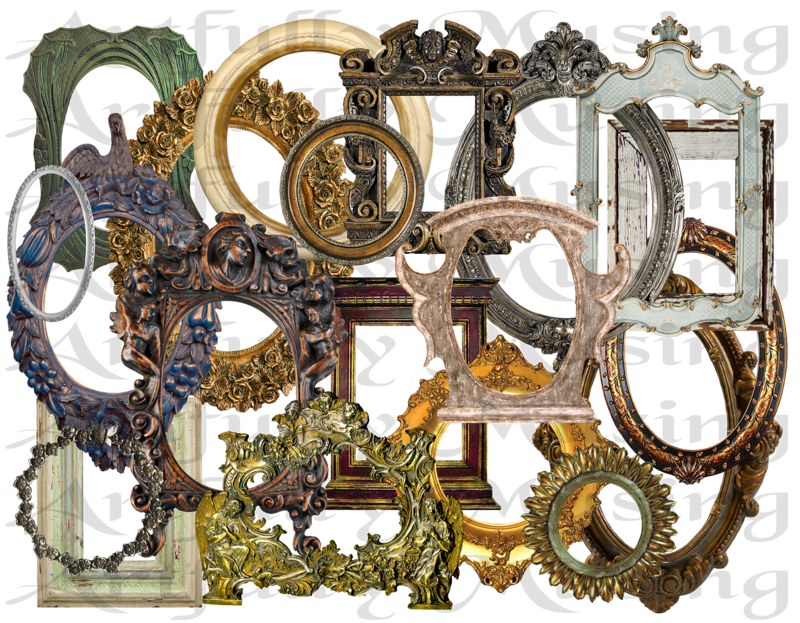 In addition to the new collage sheets I’ve designed my first digital set of Antique Frames. This is a set of 20 individual frames. Each frame is 300 DPI in a .png file format with a transparent background. With each image being a separate file, it makes it easy to size them to your needs or to use them in digital artwork. In this post, I’ll walk you step by step though how I constructed this piece. 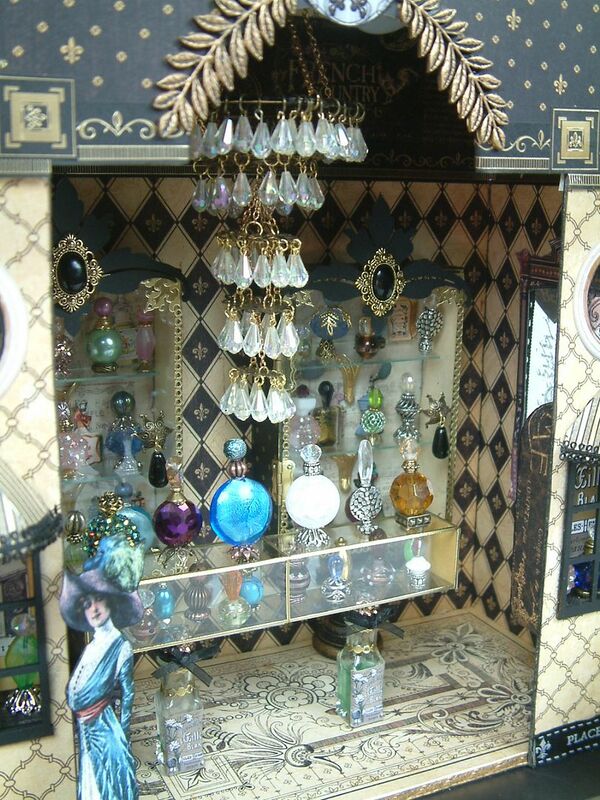 I’ll also show you how to make the chandelier, perfume bottles and glass cases. 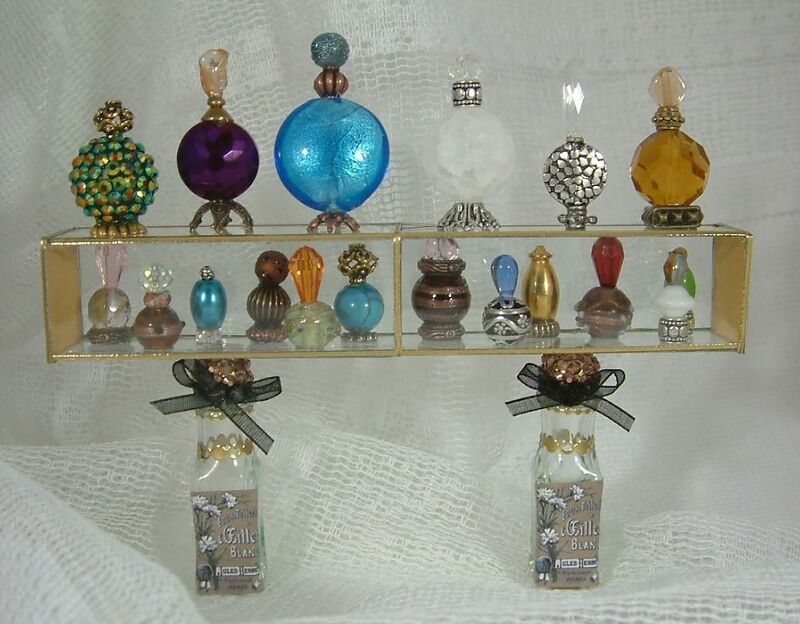 If creating a diorama is not your thing, you might enjoy making some bead perfume bottles and a glass case to display them. This isn’t the only project I created for this theme. If you love hot air balloons you’ll want to stay tuned for the next post. The overall size of the piece is 16” x 16”. 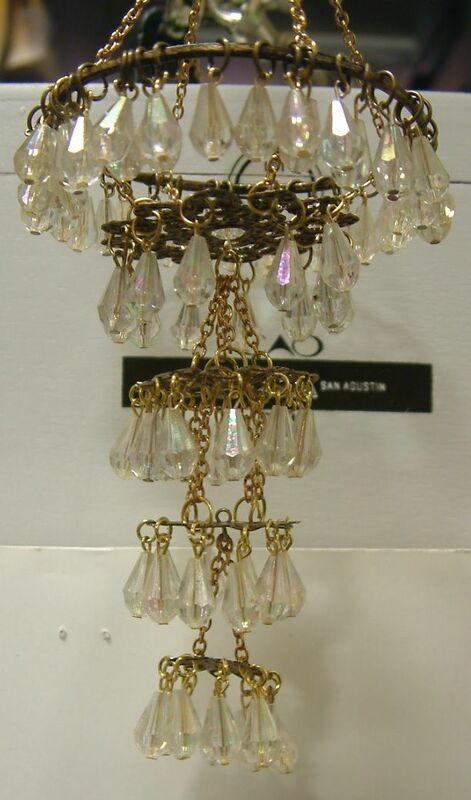 The chandelier is made from filigree, beads, jump rings and chain. The oval window at the top is a transparency. 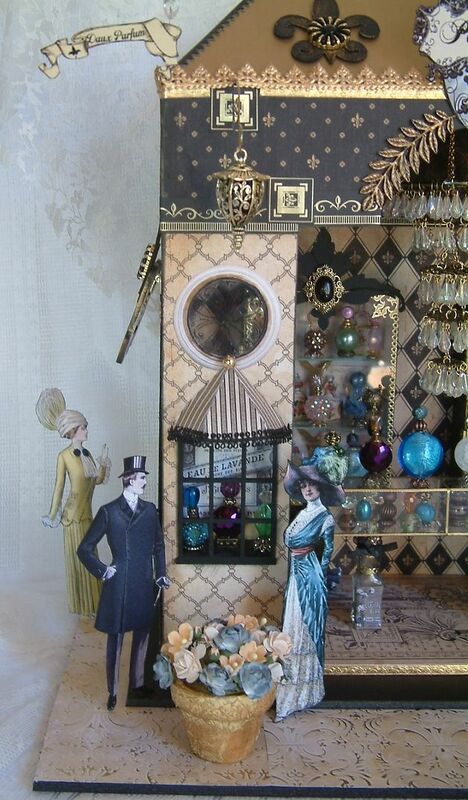 The box window display for the perfume bottles is Altoid’s tin mounted behind the window. The awnings on the sides of the shop are made from four arched windows glued together and turned upside down. 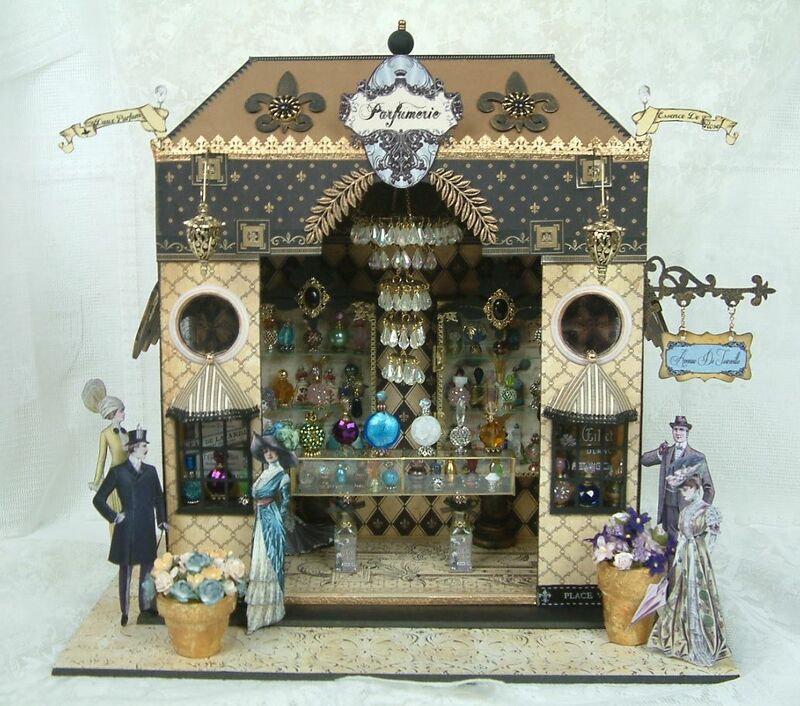 Yes, this diorama is lighted with LED Tea Lights. I’ll show you in the tutorial below how I mounted three of them inside the roof. 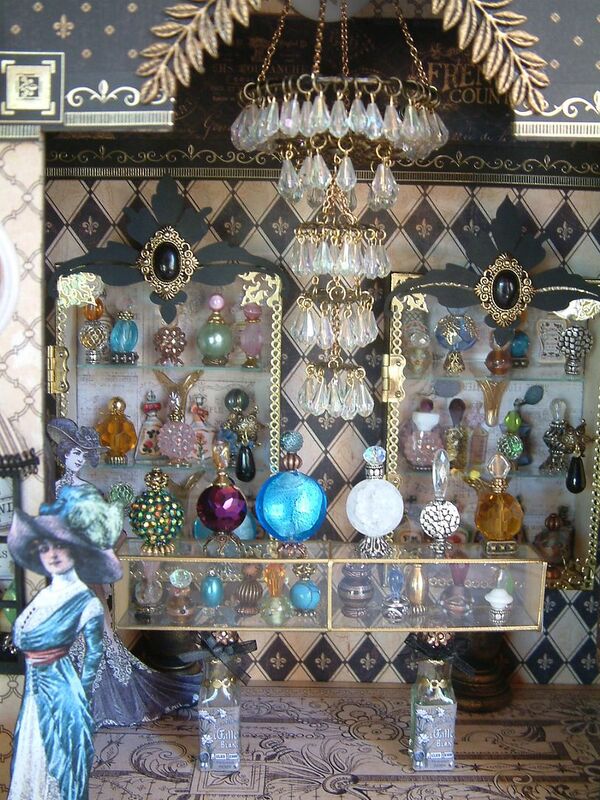 The fronts of the large cabinets are glass and I used glass microscope slides to make the glass case in front. 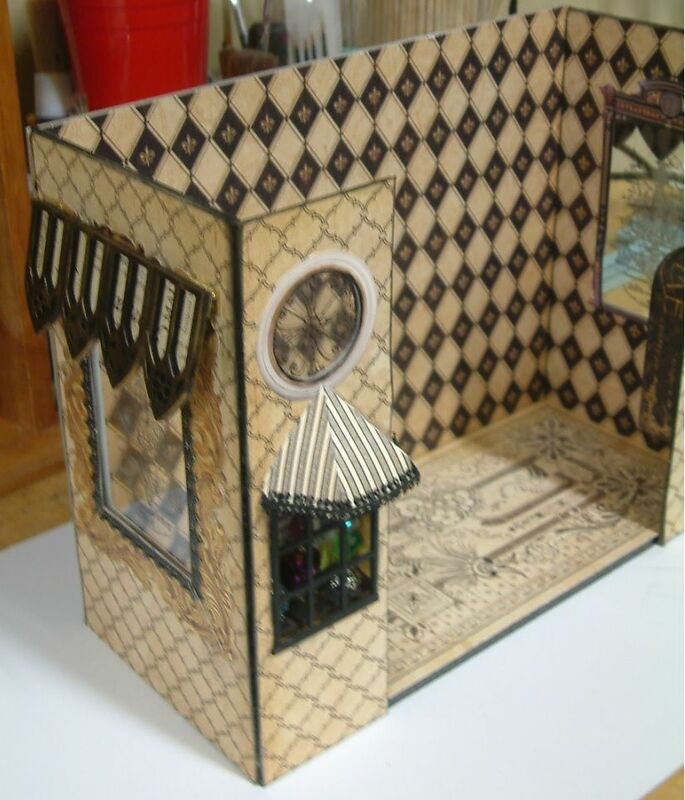 In the tutorial below I’ll walk you through how I constructed the diorama and the inside pieces. I find if I break the project down into each component then the process becomes much easier. The way I approach building something like this is to measure and cut each section as I’m working on it, rather than cutting the pieces all at once. I find my method has two advantages. First by cutting, decorating and assembling each piece one at a time, I get a better fit. Adding paper and other materials can change the measurements. Second, it makes it easier to change your mind about a particular element; which you will see that I did in this project. I approached the project by first making a decision about the size of the floor. I chose to go with a 12” wide floor as I could use 12x12 paper for the floor The depth of the floor is 5 ½” wide. This was a decision based on accommodating the glass cases and chandelier. The floor is cut from foam core and covered with decorative paper. 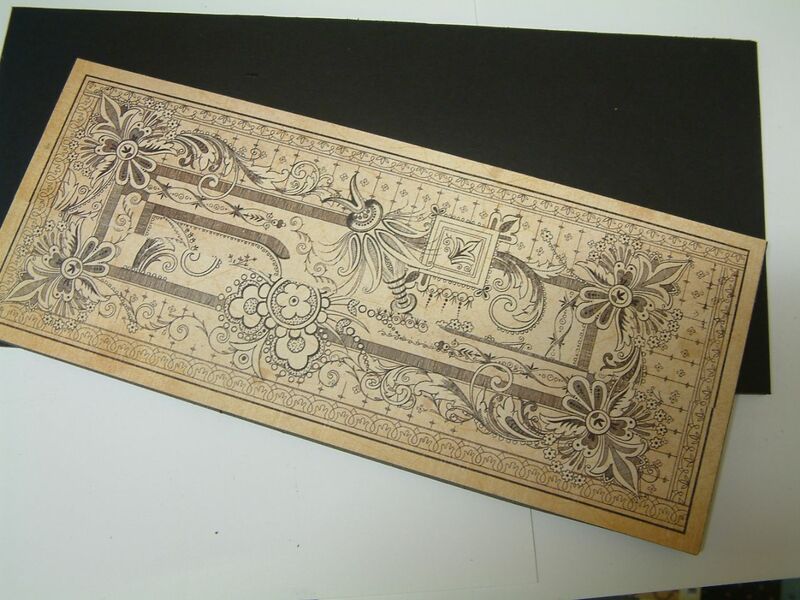 The paper is Olde Curiosity Shoppe Collection Mercurial Masterpiece from Graphics 45. Unfortunately they have now discontinued the pattern but you might find some at online stores or on eBay. Since I wanted to add people and flower pots on the outside of the store I cut two more pieces of black foam core to glue under the floor. The pieces were larger than the measurements of the floor and one piece was larger than the other. Next, I decided that I wanted small panels in the front of the shop that would contain display windows. The height of the panels is 8” and cut from heavy chipboard. I cut two holes the chipboard to accommodate windows. The oval window is made from Masonite which I painted black. You’ll notice that the openings are rough cut as when the other components are in place you won’t see the edges. The awning for the window is made from paper. I’ll be posting a video tutorial for you later this month showing you how to make paper umbrellas and awnings. I used an image from a transparency collage sheet called “Round Things” for the round window at the top. 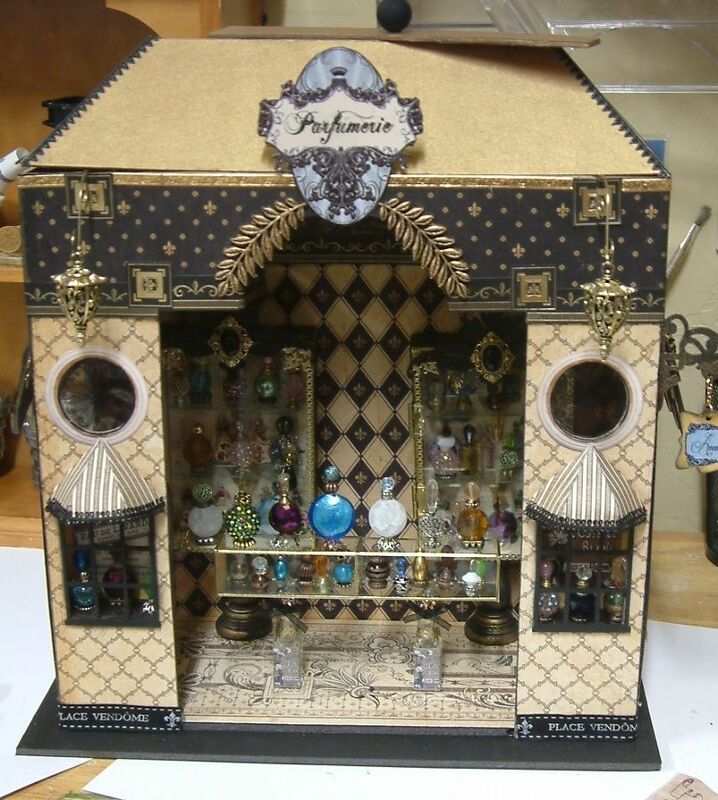 The box window that will display perfume bottles is made from an Altoid’s tin (covered in decorative paper on the inside and outside.) I used the width of the Altoid’s tin to determine the width of the panel. I made the panel ½” wider on each side than the tin. I also cut a shelf from heavy chipboard and covered it with decorative paper. I covered the front of the panels with decorative paper. I also pre-cut the paper for the back of the panels; cutting the holes for the windows but not attaching the paper to the back of the panels. Next, I glued a paper frame around the round window. 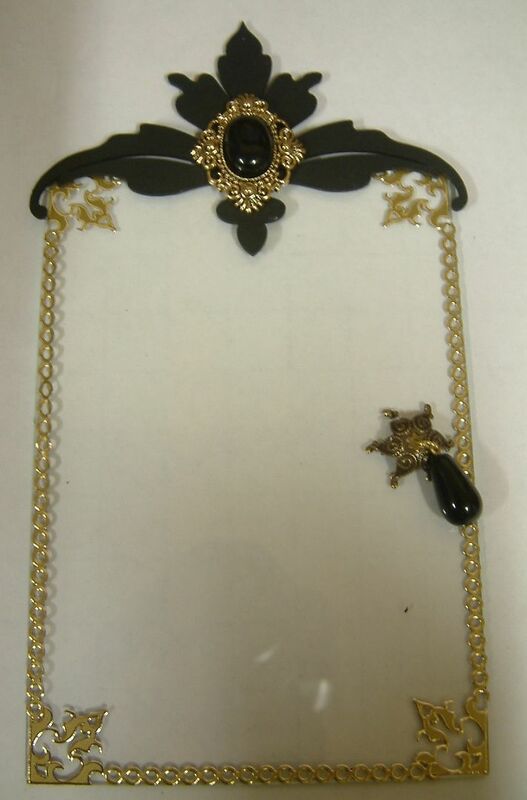 The paper frame is from my new Antiques Frames Set. I continued by gluing the Masonite window to the font of the panel. Next I glued the transparency to the back of the panel then I glued the pre-cut decorative paper to the back of the panels. I glued images from the Parfumerie collage sheet inside the Altoid’s tins and glued the shelf inside the tin using E6000 glue. 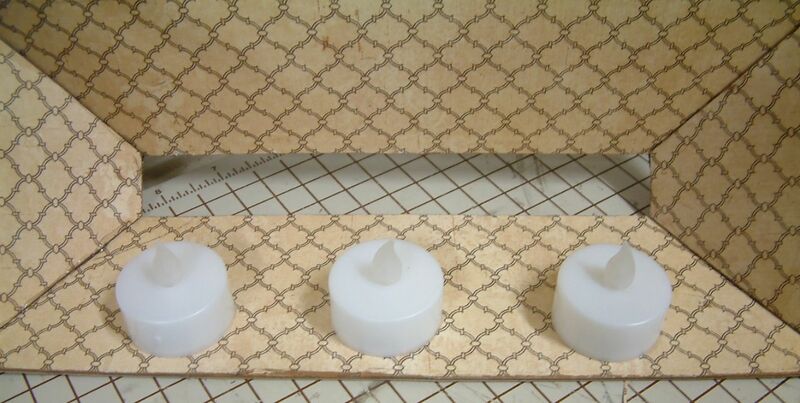 Once the glue was dry I used E6000 to attach the perfume bottles to the shelf. You’ll notice that the edges of the Altoid’s tin are ragged looking. I didn’t bother to pretty them up as you won’t see them when I attach the tins to the back of the front panels. The last step was to attach the tins to the back of the oval windows using E6000 glue and to attach the awnings. I used Black Double-Loop Ribbon to dress up the edges of the awnings. I inked all of the edges of the panels with black Staz-On ink. I used the measurement of the side of the floor to determine the measurement of the side panels. The height is 8” (the same as the front panels). I decided to insert a glass window in the side panels. I purchase lots of frames to frame ATCs. Because the ATCs usually have dimensional embellishments I don’t use the glass. I used two pieces of leftover glass from picture frames for the side panels. 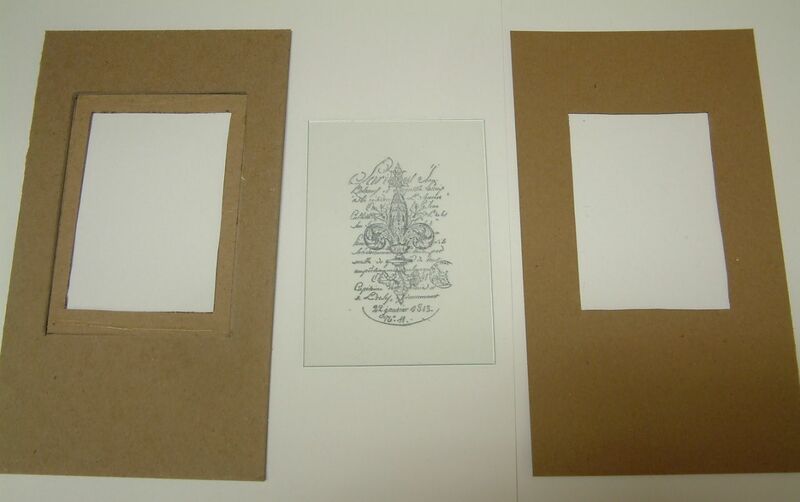 The image you see on the glass is stamped and embossed onto the glass. Click here for a tutorial on how to stamp and emboss glass. The core of the panel is cut from heavy chipboard. I cut a hole in the heavy chipboard the same size as the piece of glass. 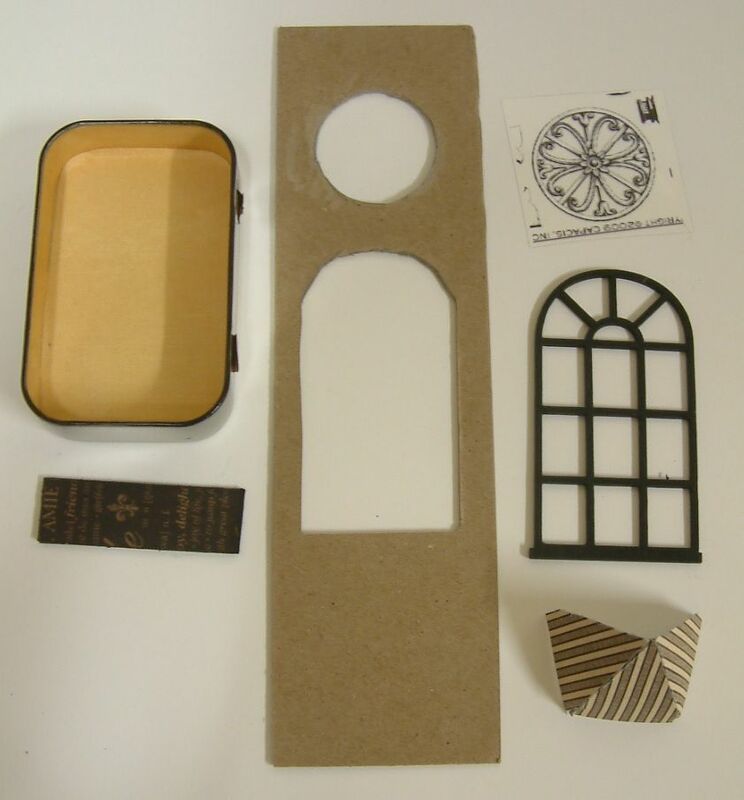 Next, I cut two pieces of lightweight chipboard with a hole smaller than the piece of glass. 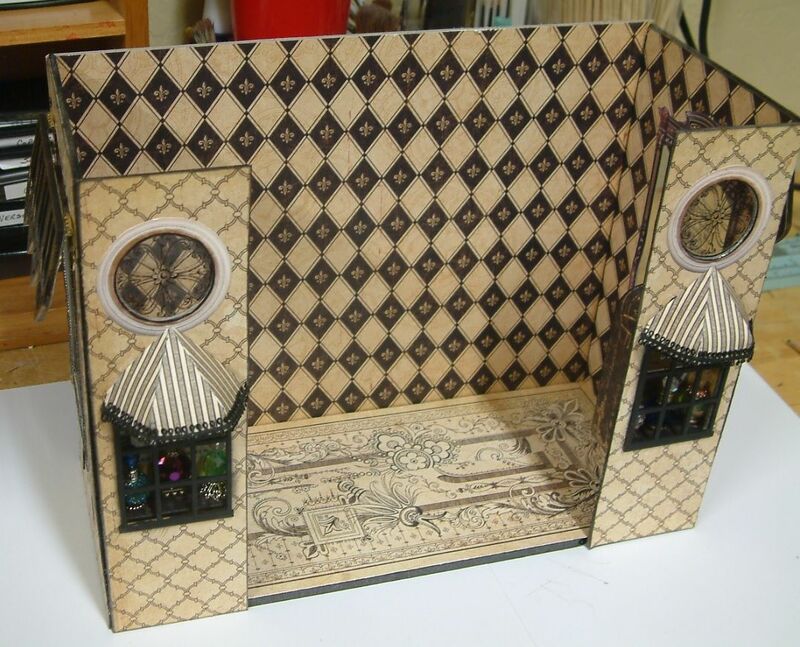 I covered one side of each of the lightweight chipboard pieces with decorative paper. You can’t see the paper in the photo as it is on the side facing down on the table. 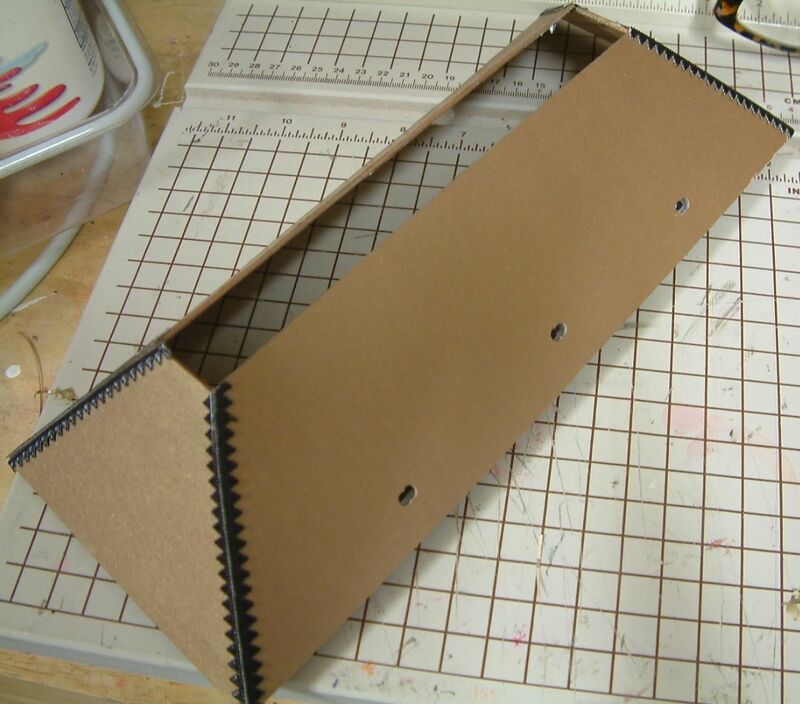 I glue one piece of the lightweight chipboard to the heavy weight chipboard. Now it is time to sandwich the glass between the pieces of chipboard. I insert and glue the glass to the combined lightweight and heavyweight chipboard then glue the other piece of lightweight chipboard in place. The glass is now snuggly sandwiched between the pieces of chipboard. I made a panel for each side of the shop. I inked the edges of the side panels with black Staz-On. 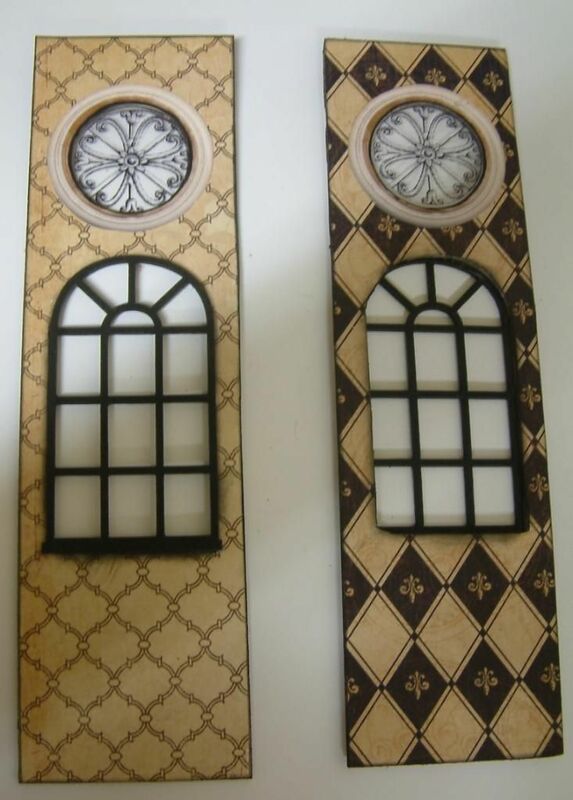 To create the awnings I started by gluing together Masonite Gothic Windows. These come 12 to a set. I painted them black then used Inca Gold Gilders Paste to add color. Next, I glued decorated paper on the back of the windows. I used Brass Gate Hinges to attach the awning to the side panels. These hinges are a little stiff so they worked great to keep the awnings in place at an angle. I attached the hinges first to the awning using E6000 glue. I decided to add a decorative border to the side panels before attaching the awnings. Next, I attached the awnings to the side panels again using E6000 glue. I now glued the front panels to the side panels using E6000 glue. Once I had assembled the walls etc. I decided to add more embellishment to the side windows. Once the panels were dry I glued them to the corners and sides of the floor. I measured the back of the floor and cut a piece of heavy chipboard for the back. I covered the back in decorative paper on both sides, inked the edges and glue it in place. These are sooooo easy to make. All you need is glue (I used E6000) and a pile of beads, bead caps and spacers. For most of the bottles I made I used a bead cap for the base. I then attached a bead. 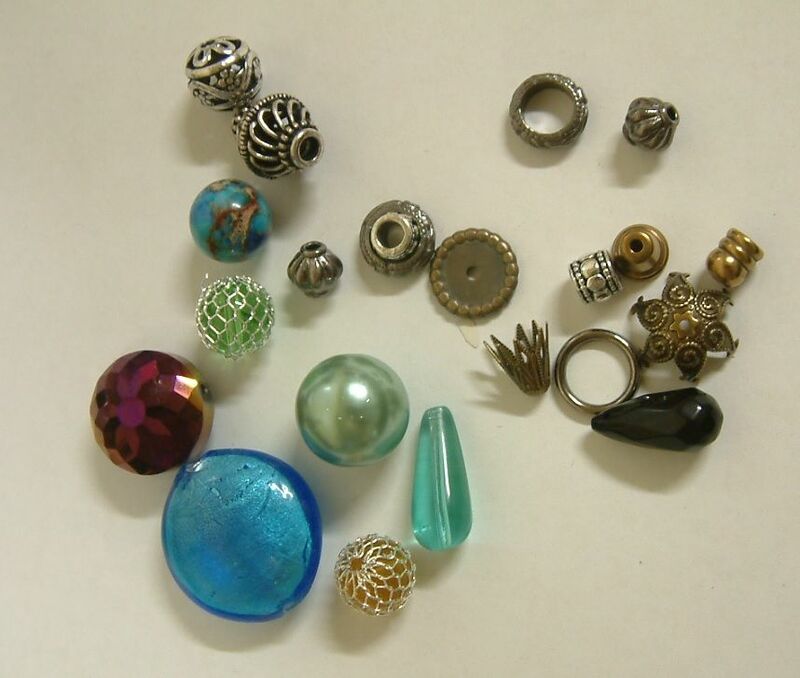 Next, I added a spacer or smaller bead cap and then another bead for the top. 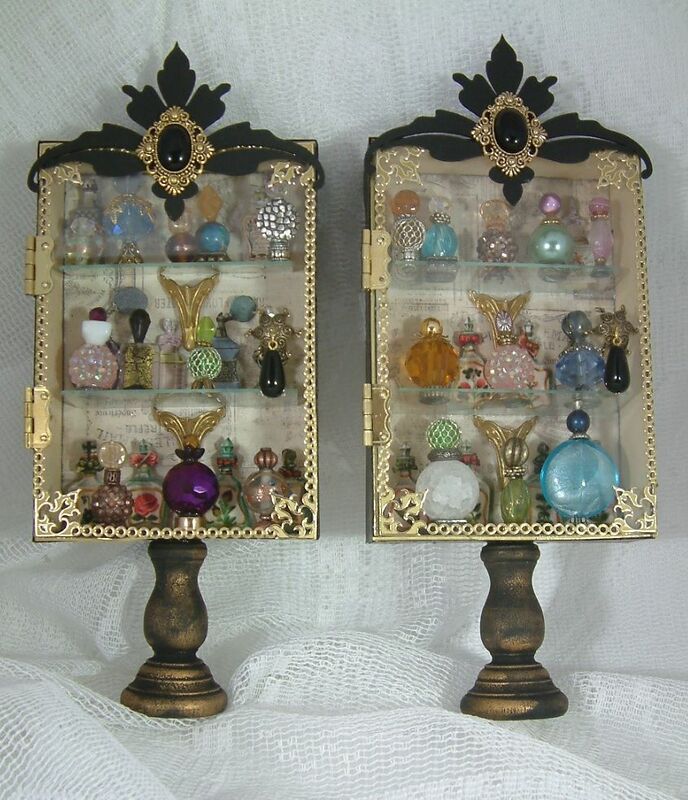 There are a couple of options for making the glass cabinet. I decided to use more pieces of glass that I had left over from pictures frames like I did for the side panels. In order to have the cabinet fit the glass I had to build my own box. I cut the back piece the same size as the glass. I cut the side panels the length of the back panel. 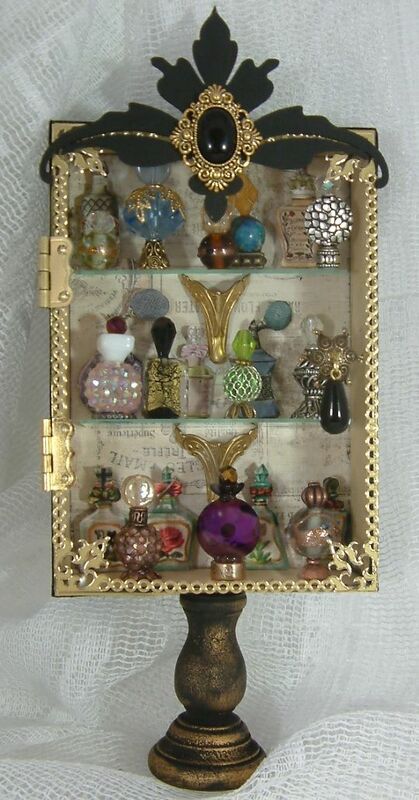 I made the sides 1 ½” deep to accommodate the size of the perfume bottles. I glued the panels in place. 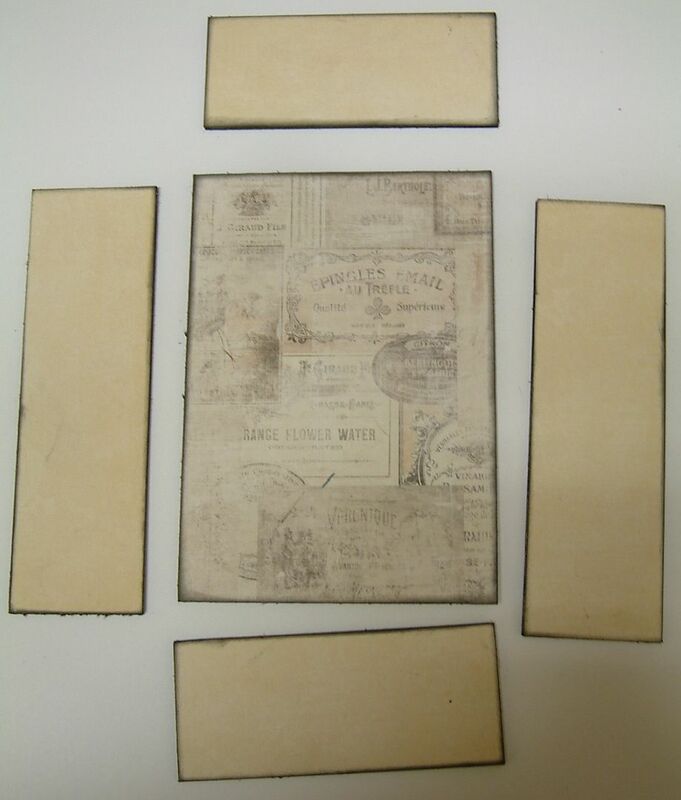 Note – I didn’t glue the panels against the edges of the back I glued them along the edges on top of the back piece. This is because the back is the same size as the glass so that when the sides are glued in place they will form a surface that is smaller than the back and will provide a surface for the glass to attach to. 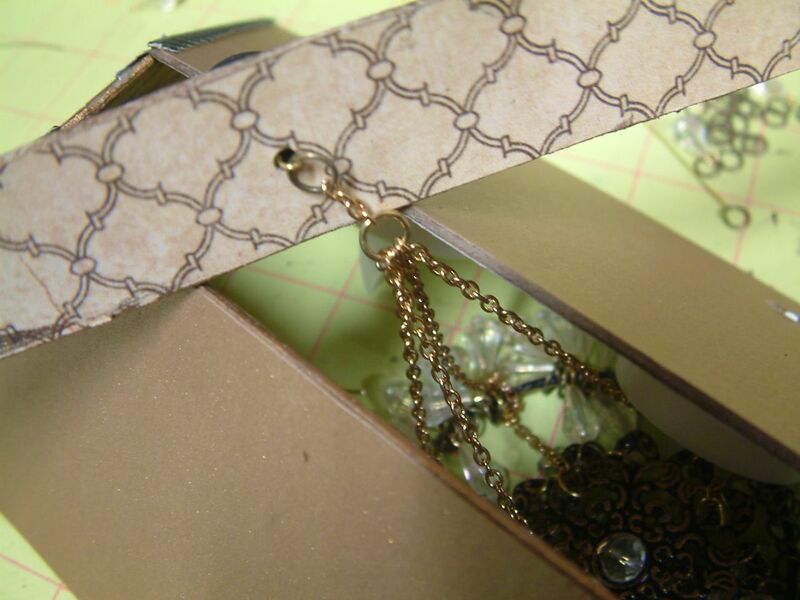 As you can see from the picture I inked all of the edges before gluing the box together. 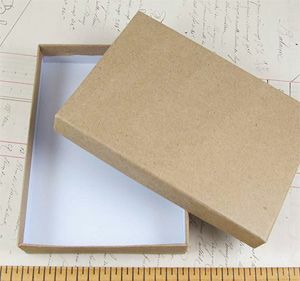 Another option is to use the bottom of a kraft box which would eliminate the need for constructing a box. I edged the glass with gold stickers. The handle is made from a bead cap and bead. 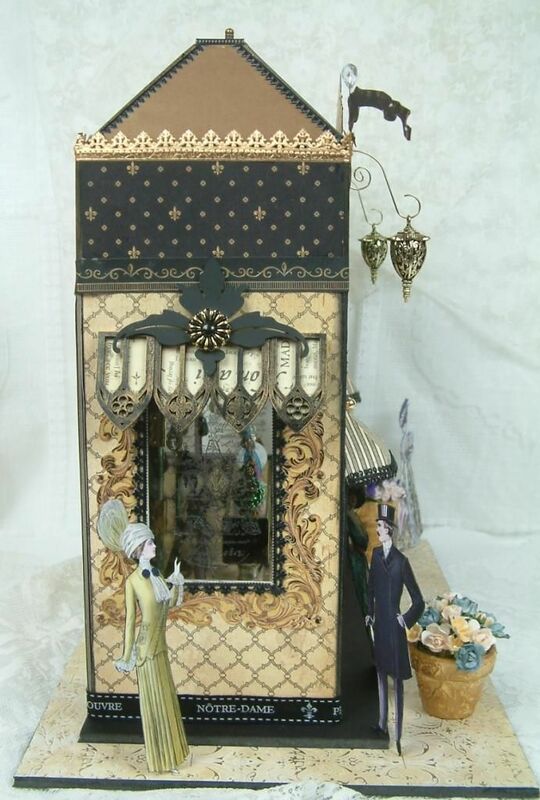 At the top I used a chipboard flourish painted black and accented with a button. I edged the box with more gold stickers. The shelves inside the cabinet are microscope slides glued in place with E6000. 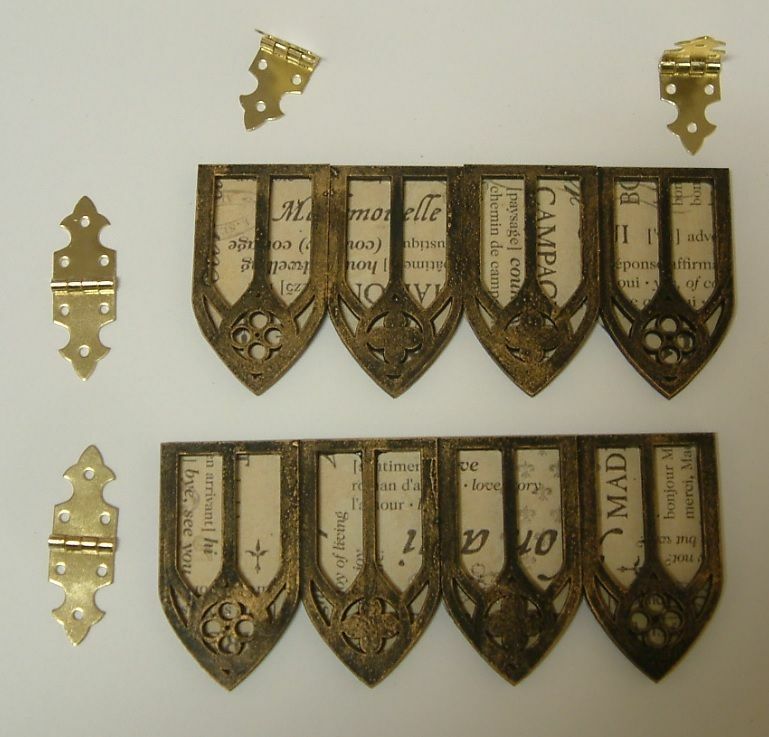 I also glued on brass box feet to help support the shelves and for embellishment. 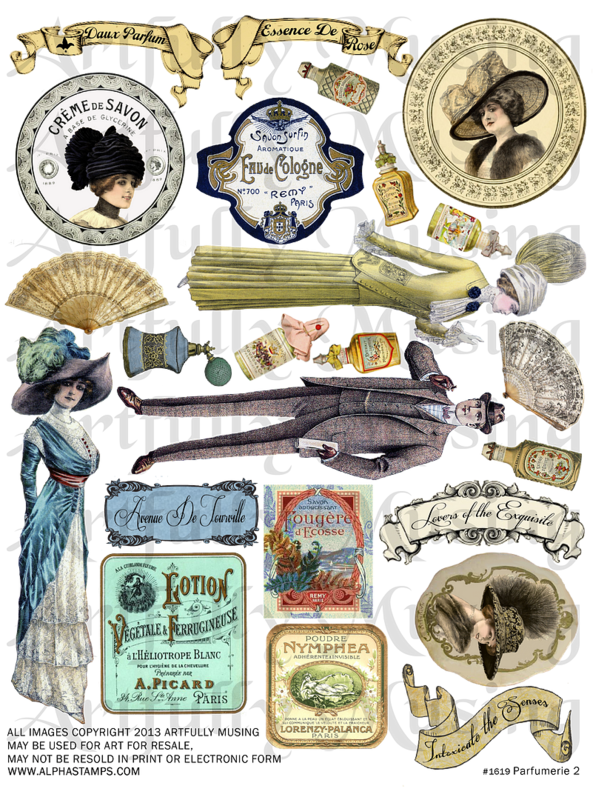 Once dry I added paper perfume bottles from my Parfumerie collage sheets. I attached them to the back of the box using foam double stick tape which popped them out from the back. I used E6000 to glue the bottles to the shelves. 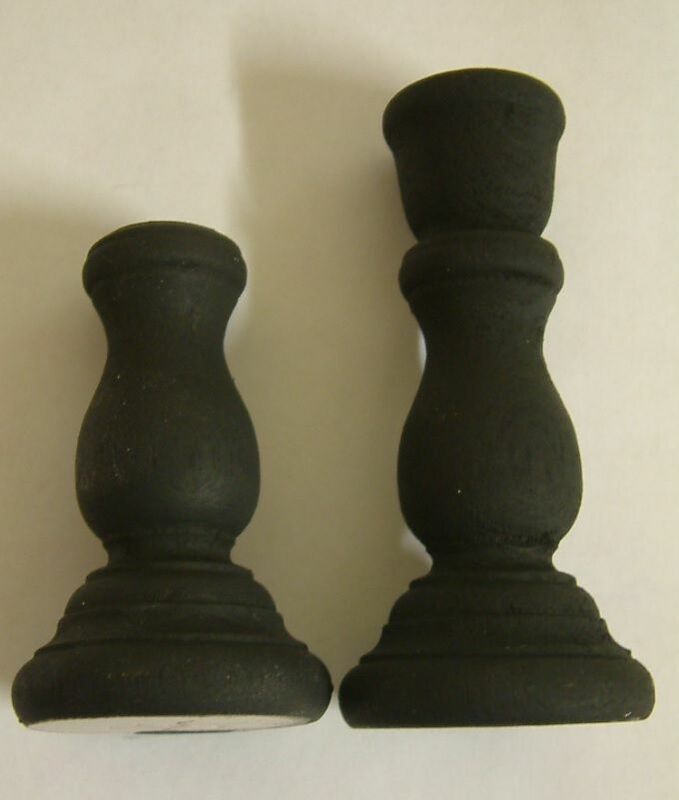 The cabinet bases are made from 3 inch tall wood candlestick holders. They were a little too tall so I cut part of the candlestick off. I painted them black and used Inca Gold Gilders Paste to add color. I glued the glass to the cabinets and attached curved brass hinges to make it look like the glass could be opened. Lastly, I attached the candlesticks to the bottom to complete the cabinet. This would make a great standalone project. Instead of glass you could use transparency film. 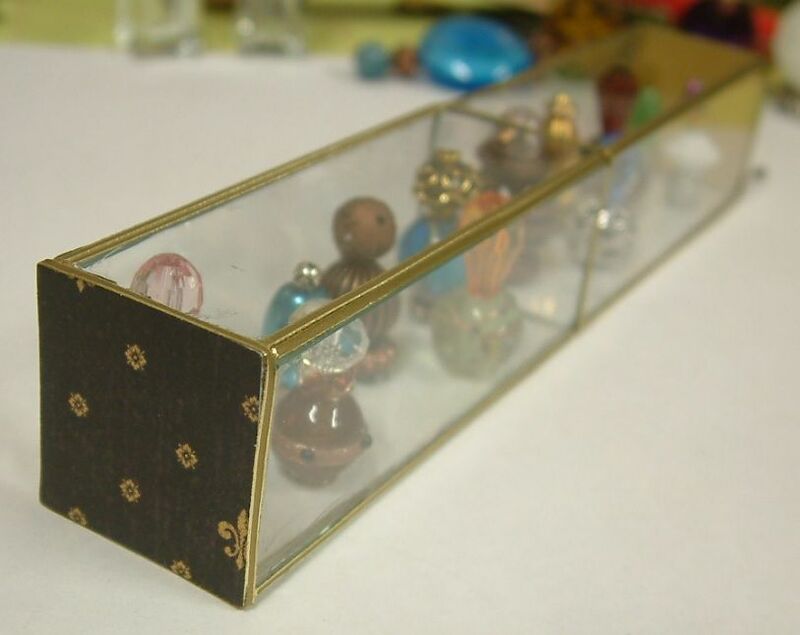 I made the glass case by gluing together glass microscope slides. I used E6000 to glue everything in this piece. After gluing together the bottom and sides I glued perfume bottles to the bottom. Next, I glued on the top. 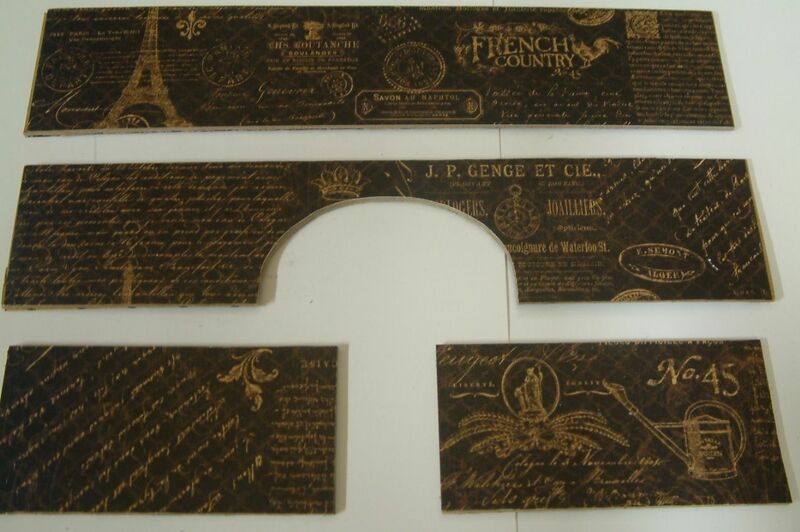 The sides are made from chipboard covered with decorative paper. To dress up the edges I used more gold stickers. The base of the cabinet is made from bottles. 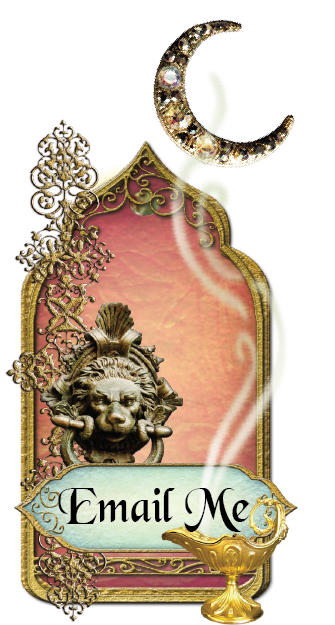 The base of the chandelier is made from a bangle and four pieces of filigree. As each piece was a different color gold, I started by painting all of the pieces black. Next, using my finger I lightly applied Inca Gold Gilders Paste to all of the pieces. 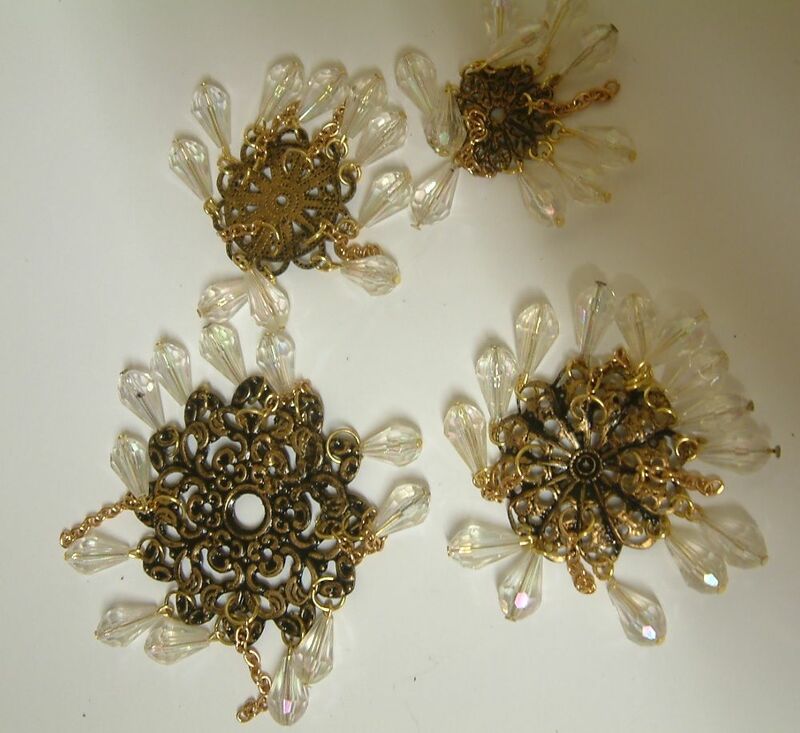 I attached beads to the filigree using eye pins and jump rings. 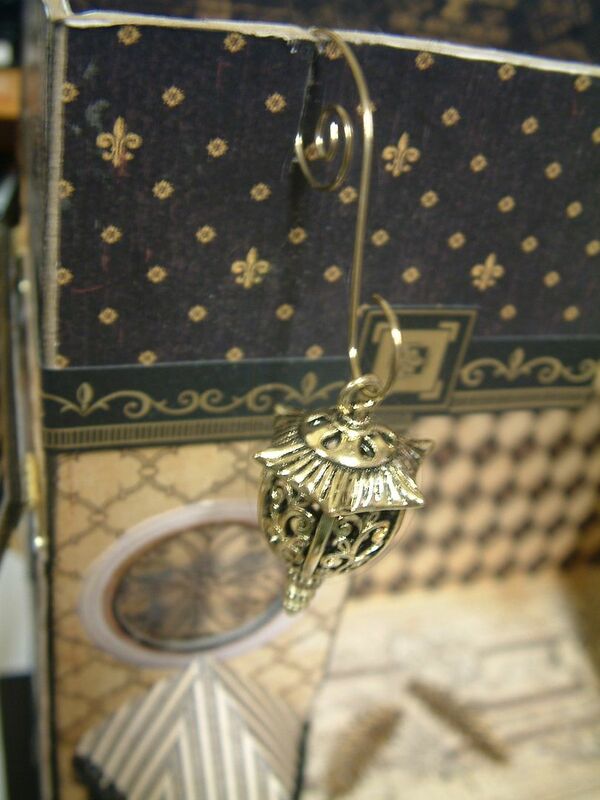 I attached the filigree to the other filigree and the bangle using chain. 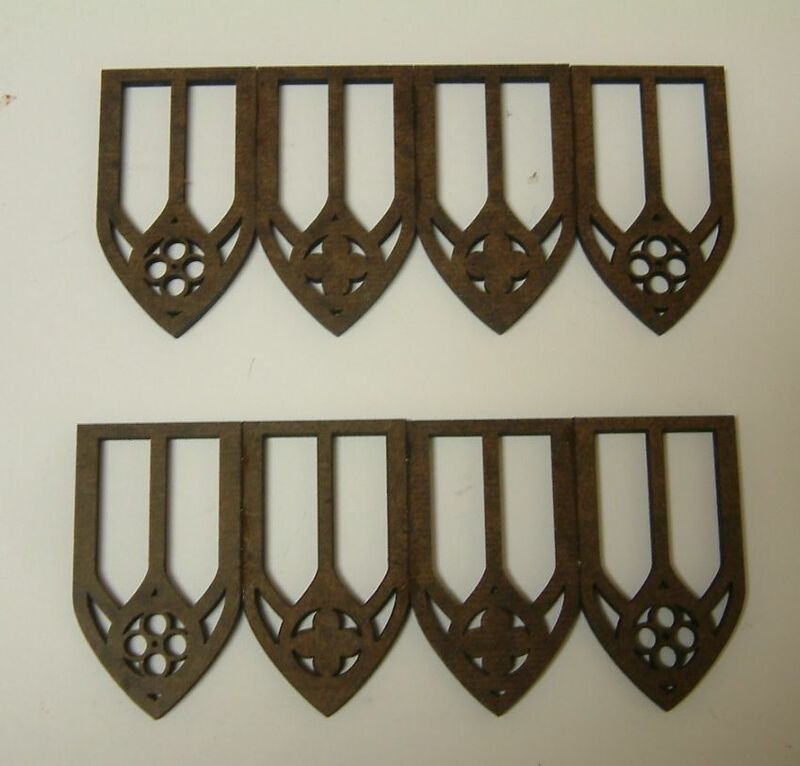 Depending on the shape of the filigree and the hole positions I used either 2, 3. or four chains for the attachment. To keep the chains on the bangle which are used to hang the chandelier from sliding around on the bangle, I used a little dab of E6000 glue to keep them in place. This is one of those areas where I deviated from original plan. 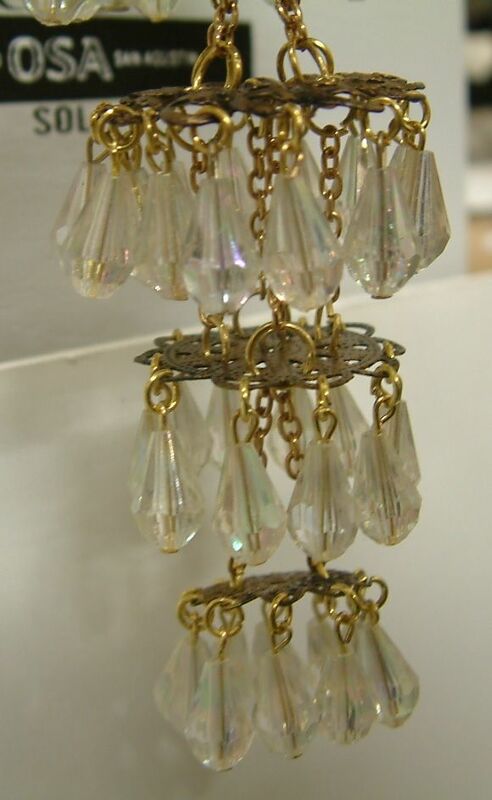 Once I made the chandelier it ended up being so long that it would have hung too low with just a roof and the 8” walls. I needed to make the walls taller so I decided to add another section to the top of the walls thereby raising the roof to accommodate the chandelier which I loved and could not bear to change. I cut 4 pieces of heavy chipboard for the front, back and sides. Note the curve cut in the front piece. I added this so you could see the chandelier hanging from the roof. I also thought it added interest. I covered all of the pieces front and back with decorative paper. I glued all of the pieces together and then glued it to the top of the walls. As it turned out I think my change of plans made for a better looking structure. Here you can see the section attached to the top of the wall. I used a border to hide the seam between the walls and the new section. Next I cut a slit in the top section to accommodate a Swirl Ornament Hook and Lantern. I glued the hook in place. To create a roof I cut 4 pieces of heavy chipboard using the measurements of the top of the shop (a piece for the back and the front and two pieces for the side). Since this is a French shop, I decide to go with a Mansard style roof. This is where the sides of the roof slope upward but don’t meet at the top. To close the roof there is a flat piece which joins it all together. This is one of the easiest roofs to make. To create the proper angle I measured 2” from each side of each piece and then drew a line from the bottom corner to the top where the 2” mark was. I then cut along the lines. I covered all of the pieces back and front with gold paper. Next, I made holes in the back piece to accommodate the switch for the LED lights. This way I can turn the lights on and off after the roof is glued in place. I then glued all of the pieces together along the sloped edges. Note the hole in the top. 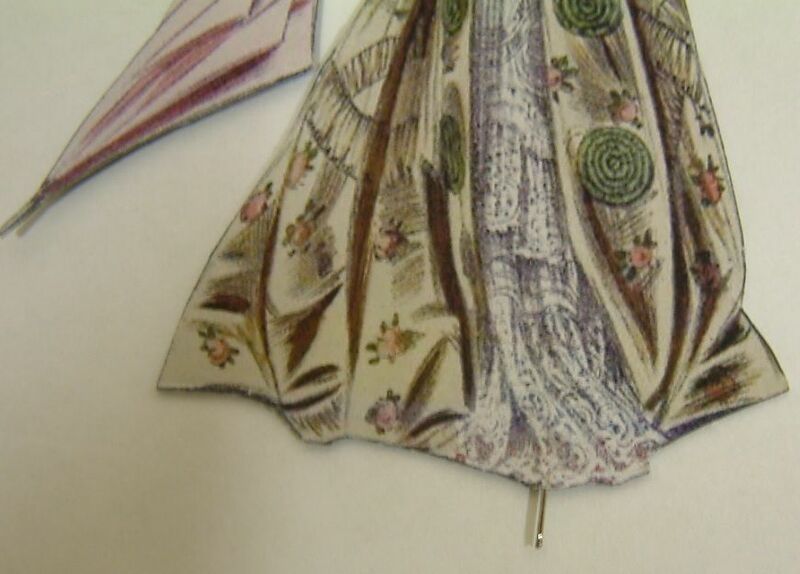 I used Dresden or German Scrap along the seams to add more detail. Next, I glued the LED lights in place. I cut a piece of heavy chipboard to fit across the hole in the top of the roof. I covered the piece with decorative paper. I poked a hole in the middle to accommodate the chandelier. 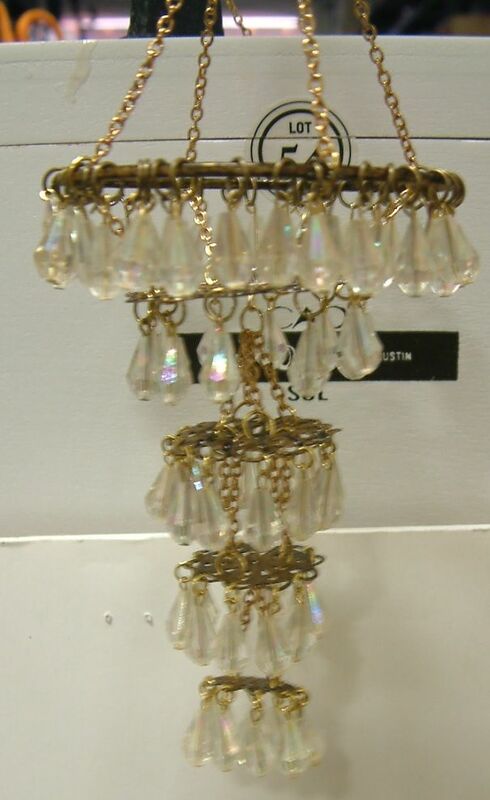 I used jump rings a bead and more chain to hang the chandelier. Finally I glued the roof onto the top section. I added more Dresden to the seam between the roof and the top section. I added resin stamped leaves to the arch and the sign to the top. I added more German Scrap to the roof for décor. Once I had the main structure completed I worked on all of the exterior details. I added more Dresden Scrap, ribbon to the bottom, banners and signs. Since the base of the piece is foam core I glue a straight pin (with the head cutoff) between the layers of the images of people. I can then stick the pin into the foam core to make the people stand in place. I can't balive in a such wonderful idea! Fabulous and a great tutorial. Laura this is so great! Thanks for sharing with us all! Love it! This is amazing! You have such a great imagination and talent! Literally my mouth fell open when I saw this. Oh My Goodness Laura, this piece is absolutely beautiful and... actually I can't even think of any other words I could use to describe this piece well enough to do it justice. I know I have said that so many times in the past regarding your work, but honestly this piece is beyond my realm of vocabulary to even attempt to describe its beauty. I am totally without words!!!! Your talent is endless and beyond my comprehension!! I am literally in awe.... Thank you so very much for everything that you do and share with all of us! Have a happy and safe July 4th!! I am blown away. This is beautiful and completely amazing. Thank you so much for the wonderful tutorial. I can't wait to try my hand at some of these elements. 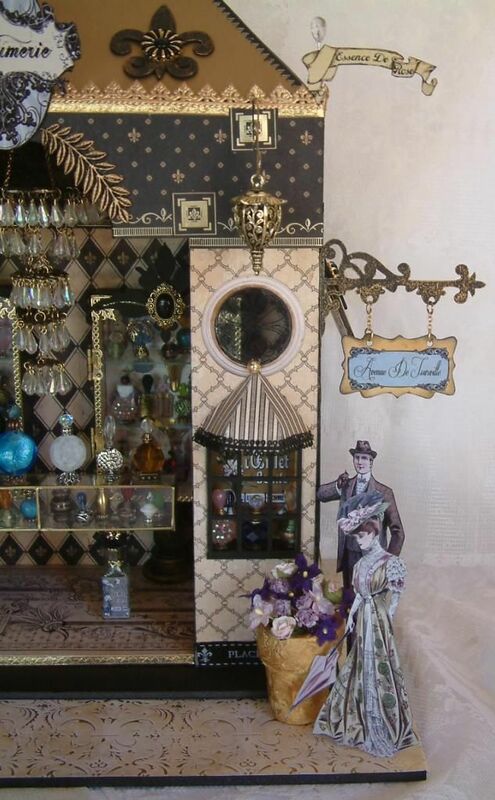 thank you so much for sharing.. this shoppe is absolutely gorgeous.. i love the perfume bottles.. so darling.. the whole thing is just filled with detail.. you are very creative.. and inspire us all. Stunning ! Thank you for 'walking' us through how you made it. I really love the sides with the people standing there--well I love it all but those caught my eye. I'm in awe, such a beautiful gorgeous piece! I just saw the Selfridge series and this is totally reminds me of it! Oh my! 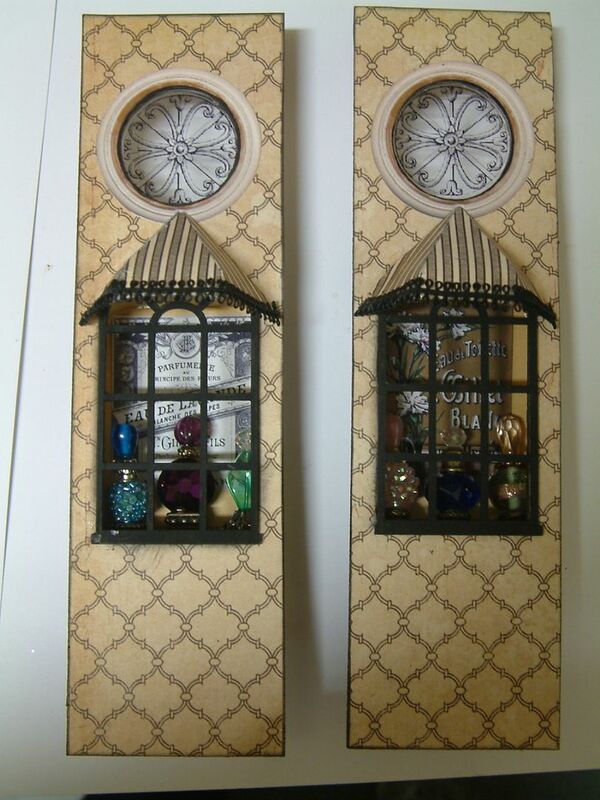 I haven't even started my armoire yet and now you've done this I want to make this too. You are so very very clever and I take my hat off to you. This new project is simply...gorgeous, fantastic, amazing and so elegant! You're a real artist! Thanks for share! Your vision and execution of this project is incredible. I an in awe of your creative spirit. Absolutely incredible work! Sharing this! Also, such a clever idea to use microscope glass....I never would have thought of that. Your new collage sheets are drool worthy as usual. 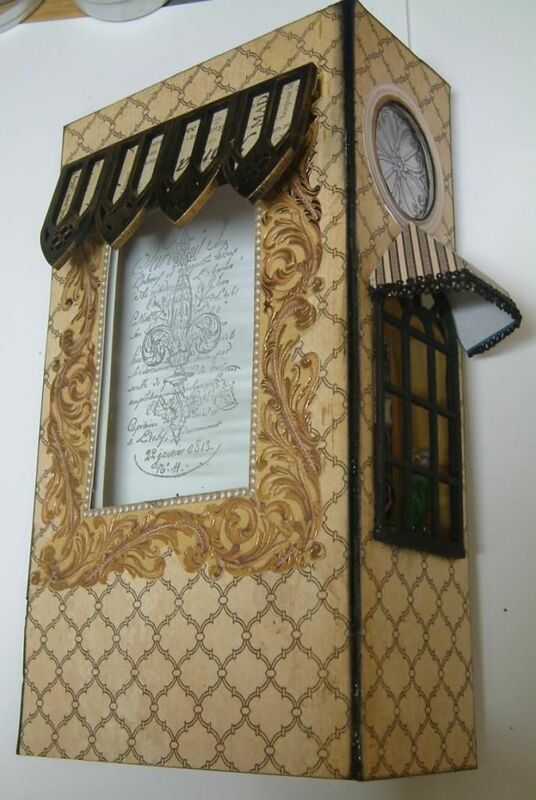 I personally have not made anything so extravagant, though I think I might try making this....I love it! Thanks for yet another incredible art installation in miniature!!! It just leaves me breathless and totally in awe of your creativity and process. This is very, very cool--thank you for sharing your talent and teaching your craft so generously. wow, this is incredible. Such work! thanks for sharing! 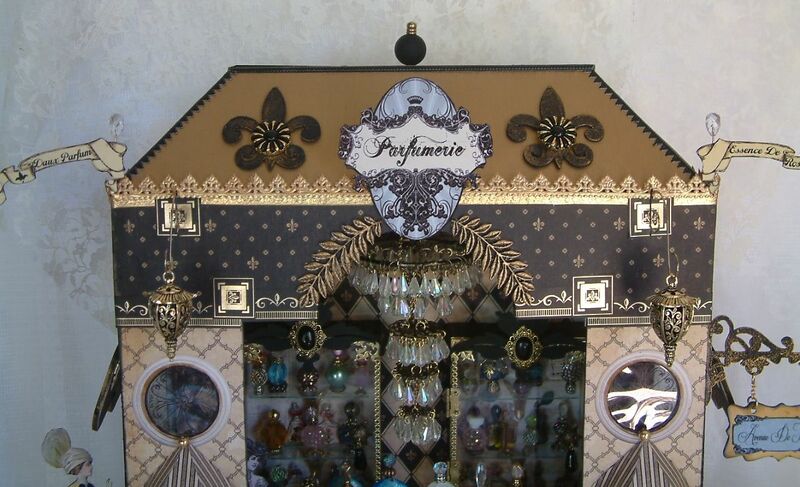 Amazing and soooo beautiful Parfumerie!!! Breathtaking!! Several years ago I stumbled across a picture of your magnificent altered bottles. I drooled over those, read the tutorial, drooled some more, then continued on with life. I was in a baby-producing stage in my life. 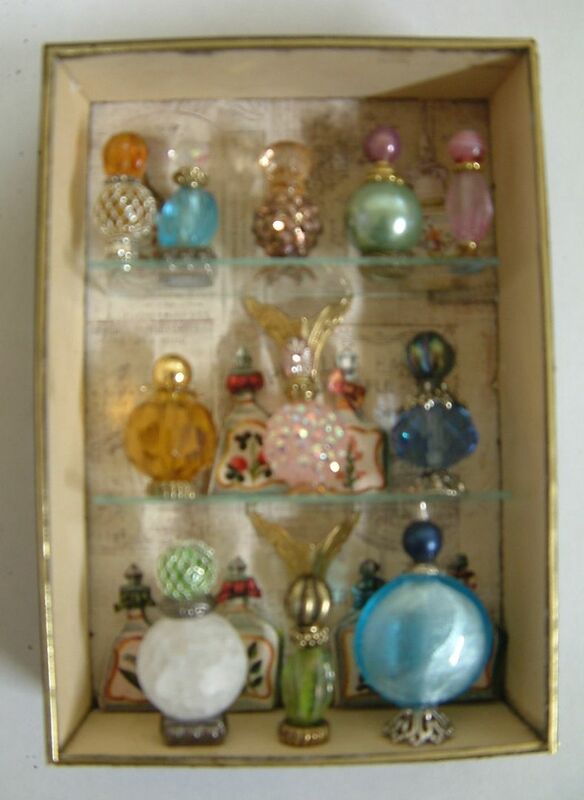 A couple of years later I saw a picture of your gorgeous perfume bottles (while searching for pictures of real miniature perfume collections) and again fell in love. 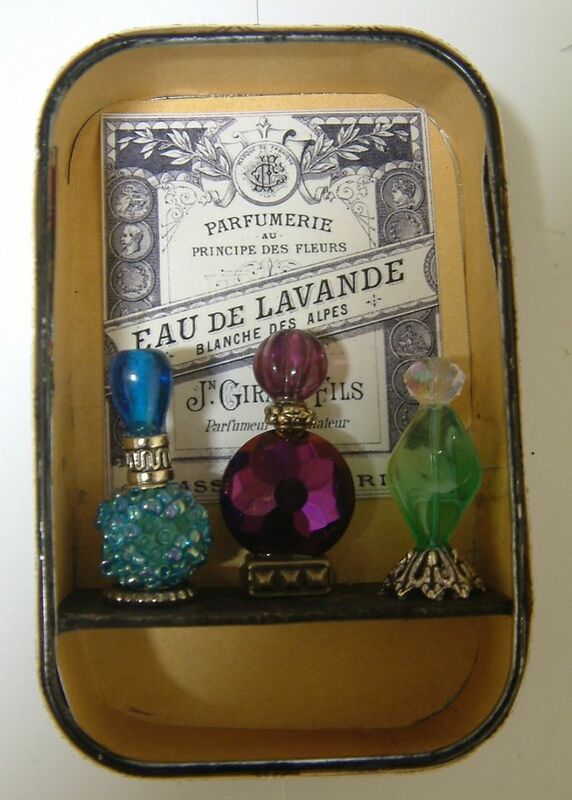 I bought some beads from eBay and had all my sisters-in-law and even my mum hooked on making tiny perfume bottles. We were obsessed, we made over a hundred altogether. Even our young daughters made some. Last week while discussing with my daughter the different ways we can recycle old bottles and jars, I remembered your magnificent altered bottles and searched high and low for them. It took hours but finally I found them. I was determined to never lose track of you again, so I began to check out all your other amazing artwork, and lo and behold! 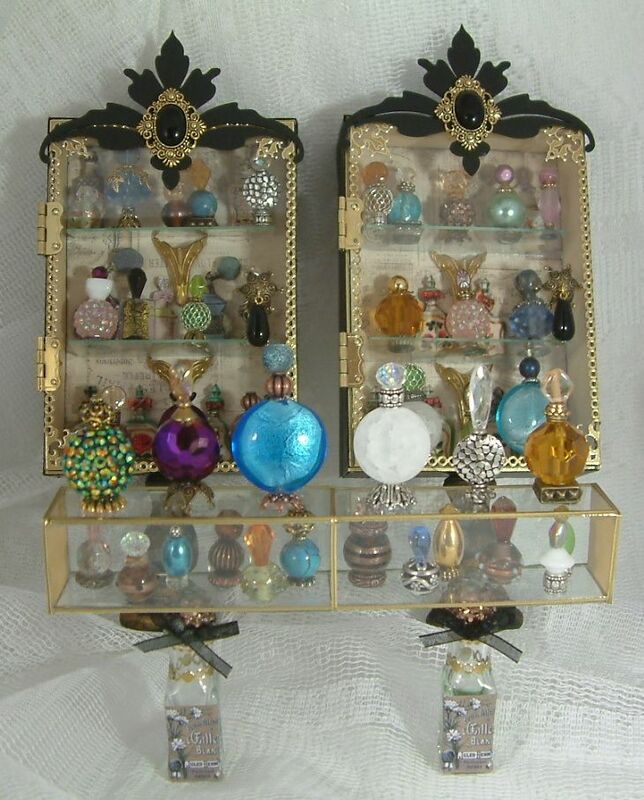 I found that you are the artist behind the inspiration for our old bead-perfume-bottles frenzy!!! I am in awe of your talent. I look forward to enjoying your blog in the coming days and also sharing it with my daughter who shares my love for all things lovely and miniature and magnificent. Oh and I looooove the chandelier! I love the whole project but particularly the chandelier, it's breathtaking! 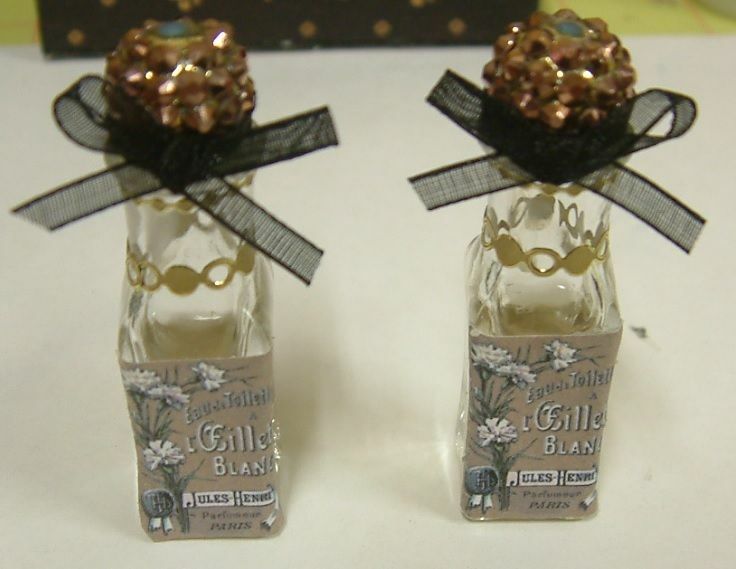 And of course the perfumes are just outrageously gorgeous, we weren't able to make ours as lovely as yours.